Miami and Los Angeles are both ethnically diverse concrete jungles built around beaches and sunshine. But they have one other surprising thing in common: Lutheran schools. Pacific Lutheran Jr./Sr. High School in Los Angeles overlooks a sprawling neighborhood of homes and businesses, much like Holy Cross Lutheran Church and School in North Miami (below). Pacific Lutheran Jr./Sr. 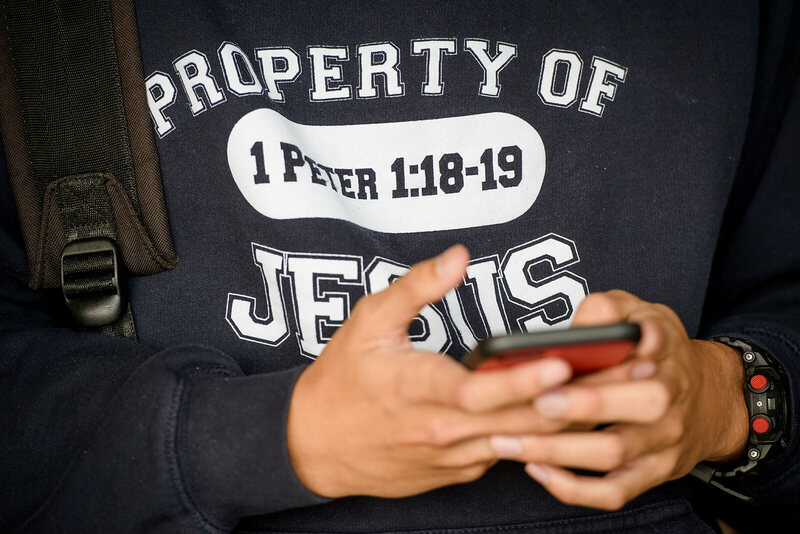 High School in Gardena (L.A.), Calif., and Holy Cross Lutheran School in North Miami teach the Word of God to the children of their respective cities. Watch a video about the two schools. The schools’ unique settings and situations require continuous adjustments. Yet the administration and faculty of both schools work hard each day to serve whomever the Lord brings to their classrooms. By His grace and mercy, the Word is bearing fruit in the lives of the children and their families. “Putting Christ first. Learning for life. Honing life skills. Serving church, school and community.” Pacific’s website plainly states the direction and mission of the school. But the reality is always harder than writing a slogan. In the middle of Los Angeles, Lutheran high schools have struggled to survive. Since the 1960s, five Lutheran high schools have closed there. Pacific now stands as the only Lutheran high school in L.A.
Lucas Fitzgerald, principal of Pacific, watches as students arrive for chapel in the morning. 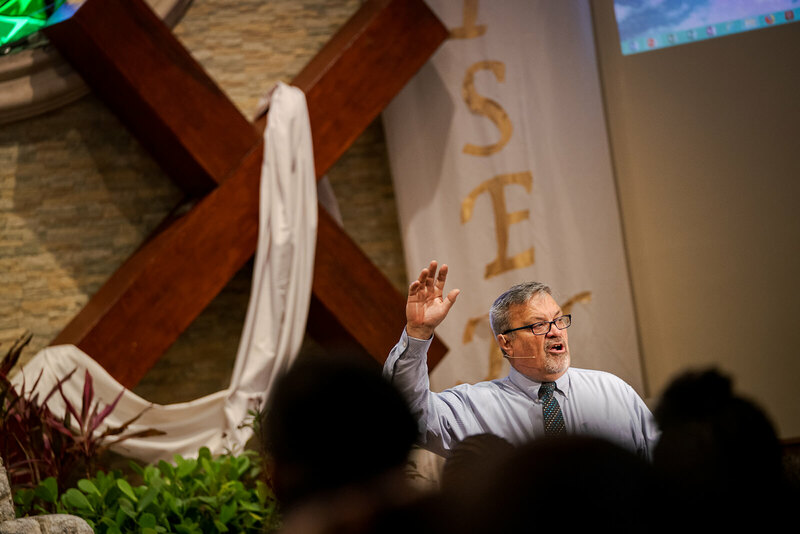 In the middle of an ostensibly non-Lutheran setting, Principal Lucas Fitzgerald works with the board, administration and faculty to ensure that the approximately 100 students at Pacific hear God’s Word daily and learn the truths of Lutheran doctrine as they receive an excellent education. 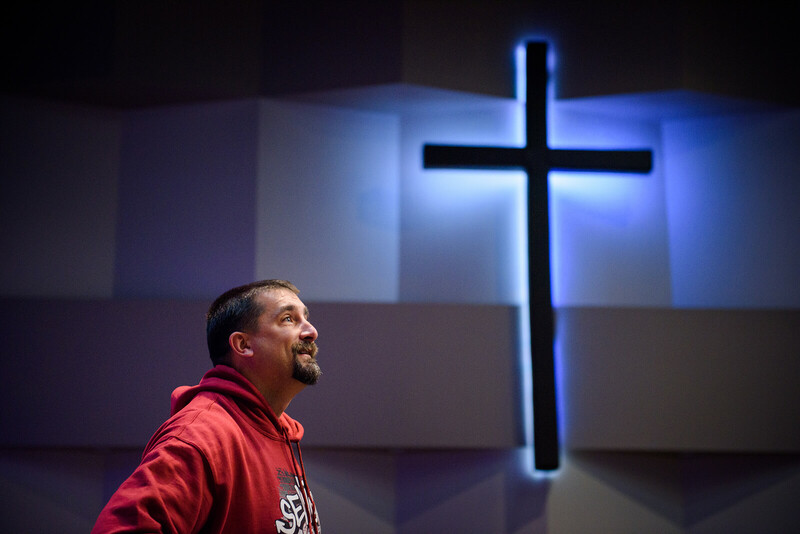 Pacific is currently leasing a building that previously housed an Assembly of God (AOG) school and remains the location for an AOG congregation. The congregation has been a gracious partner in allowing Pacific full theological autonomy in theology classes and chapel each week. “Our student body is 25 percent white, 25 percent Hispanic, 25 percent African-American and 25 percent Asian,” said Principal Lucas Fitzgerald. “We are the most — or at least one of the most — ethnically diverse schools in the Synod,” said Fitzgerald. 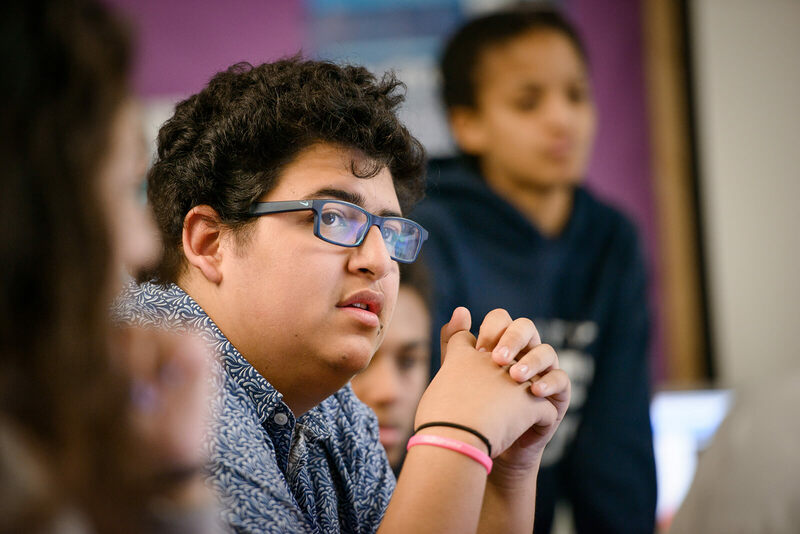 “Our student body is 25 percent white, 25 percent Hispanic, 25 percent African-American and 25 percent Asian.” This reflects the diversity of L.A. Not only is there ethnic diversity among students, there are few lifelong Lutherans. Over the last two years, 10 students have been baptized at the school and are being cared for by local LCMS pastors and congregations. The students are from China, South Korea, Vietnam and the greater Los Angeles area. A student listens during class. 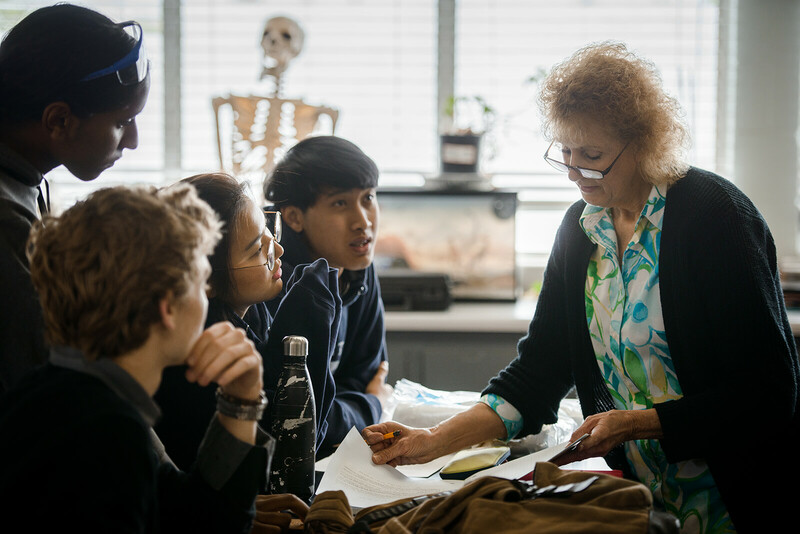 Students’ questions are always welcome, and different points of view are common in the classroom, including those of students who are not from a Christian background. All of these inquiries and discussions are brought to the cross of Christ, who died and rose for all. And the Good News of justification by grace through faith because of Christ is proclaimed and modeled for all. The school works in the middle of L.A. to continue to teach the Word of God to whomever God allows them to teach. And for those opportunities, they rejoice. “Fixing our eyes on Jesus, the pioneer and perfector of faith” (Heb. 12:2). Pacific’s theme verse, vision and goal. Simple, difficult and, by God’s grace, bearing fruit. Most people come to Miami because of the beaches and the weather. But the people at Holy Cross Lutheran School, North Miami, stay because it’s a family. 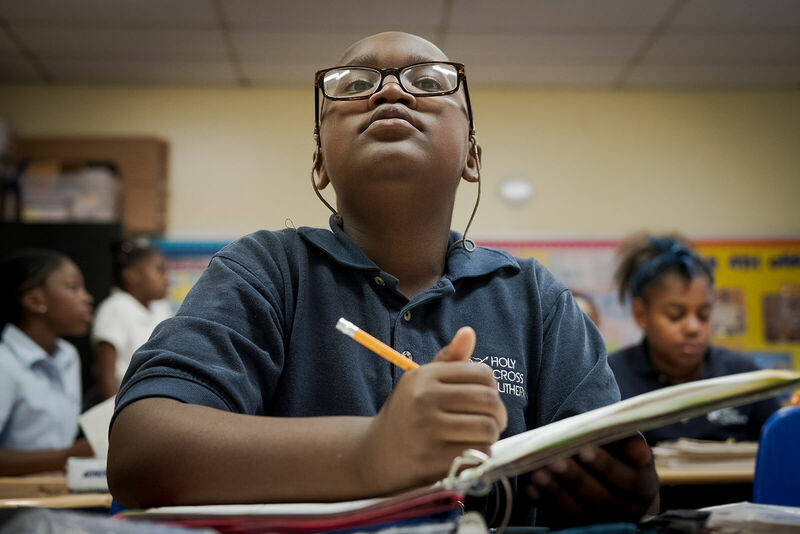 “Every day they tell me great things about Jesus,” said Jude Francois, a fourth-grade student at Holy Cross, when asked what he likes best about his school. He said that he loves to be an acolyte at Holy Cross Lutheran Church on Sundays. 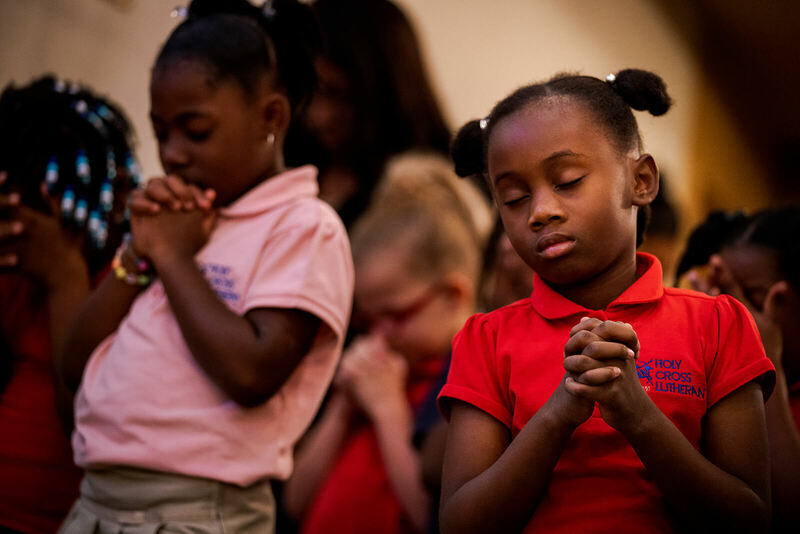 “Every day they tell me great things about Jesus,” said Jude Francois, a fourth-grade student at Holy Cross. Holy Cross is unique among Lutheran schools. 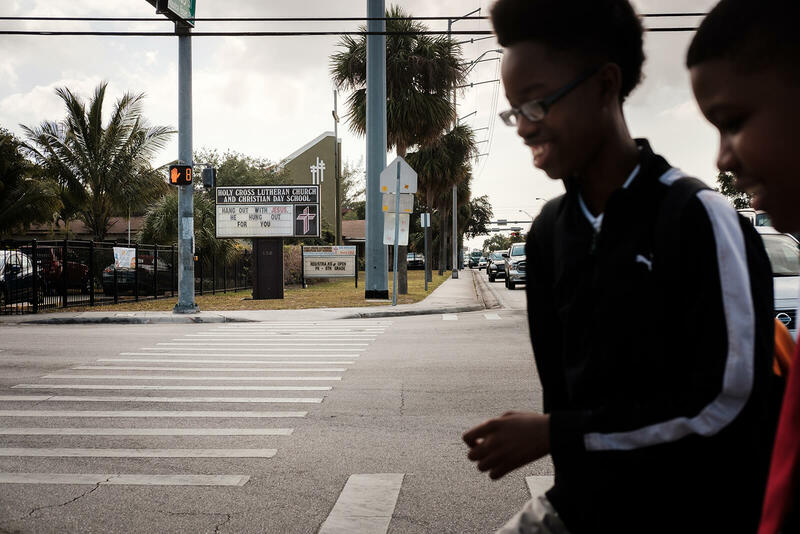 The student body is almost 90 percent Haitian, reflecting the neighborhood surrounding the school. Though the property is across the street from the public high school and middle school, many non-Lutherans choose to send their children to Holy Cross. Holy Cross offers something unique. Principal Sherri Mackey, who grew up in the neighborhood, commented that many parents seek a safe place for their children that will also provide a quality education. Holy Cross does that and even more. Here, the children learn about God’s love in Christ. Holy Cross has been around since 1951. The original school was housed in the church building, using the rooms in the church during the week, then setting up for church use every Friday. 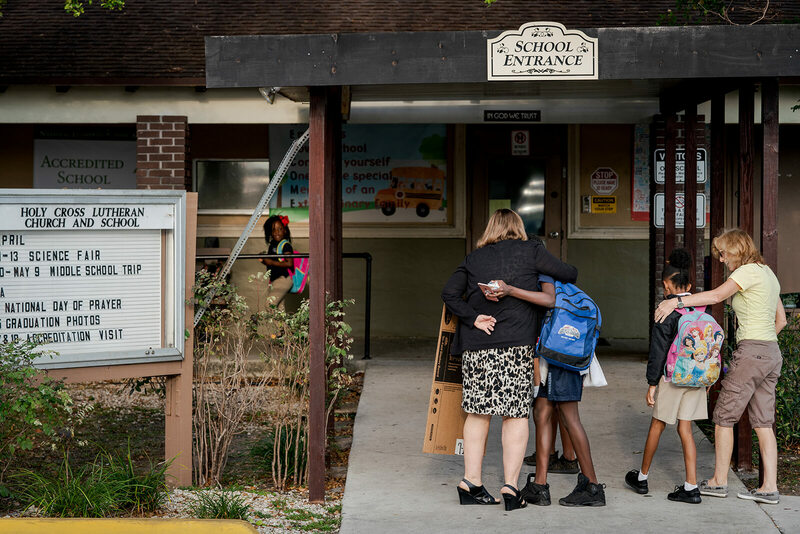 Throughout the years, the church and school have continued to work together to bring the Gospel to the surrounding community in North Miami. The Rev. Dennis Bartels, pastor of Holy Cross Lutheran Church, leads chapel at the school. Below, students pray during the service. Currently, the school is composed of six additions to the original building, including what used to be the parsonage, but the growing student population — 400 students this year — needs even more facilities. “Family” is an important word and feeling at Holy Cross. Many family members return and bring continuity in the midst of transitions and modifications. 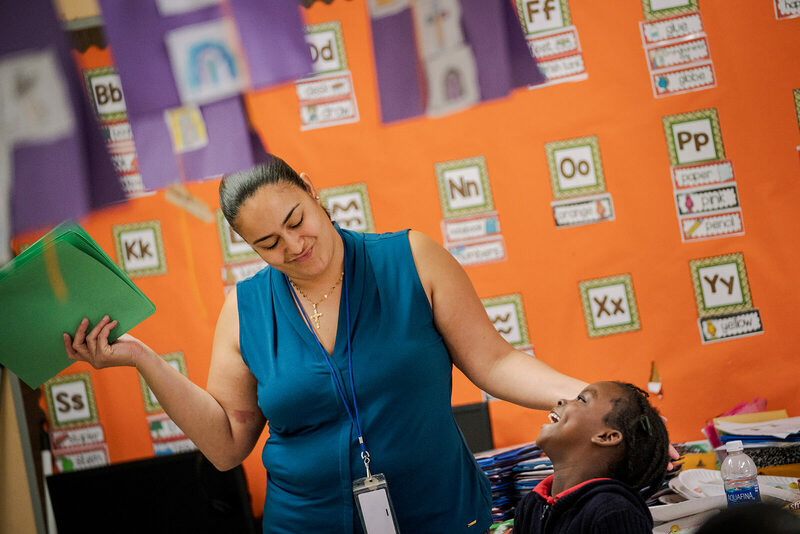 Teacher Estrella Quiroz works with students at Holy Cross. “A lot of people have been here a long time,” said Beverly Thompson, a member of Holy Cross Lutheran Church, who teaches eighth-grade home room and various classes in addition to serving as the athletic director. “We are a very close-knit group.” Thompson’s children all graduated from the school. Her story is not unique at Holy Cross, as many alumni have sent their children there. Lutheran schools share Christ and welcome children into God’s family — in L.A., Miami or wherever the Lord allows. The challenges are different. The situations change. But God is faithful to His promises, and Lutheran schools continue to teach God’s Word. God of the nations, You provide for Your children through teachers and schools. 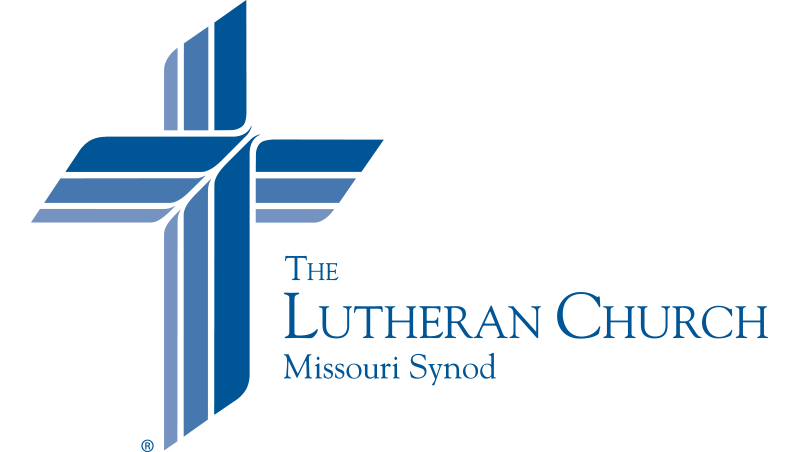 Bless the work of Lutheran schools, that the teachers and staff might share the love of Christ with the children in their care. Bless the students, that the Word might take root and they might live lives in service to You and their neighbor. We especially ask You to continue to strengthen Pacific Lutheran in L.A. and Holy Cross in Miami. We thank You for blessing them. Be with all schools as they seek to serve the communities in which they exist, that all might learn about Your love in Jesus Christ. Amen. Dr. Kevin Armbrust | Interim director of Editorial Services for LCMS Communications.